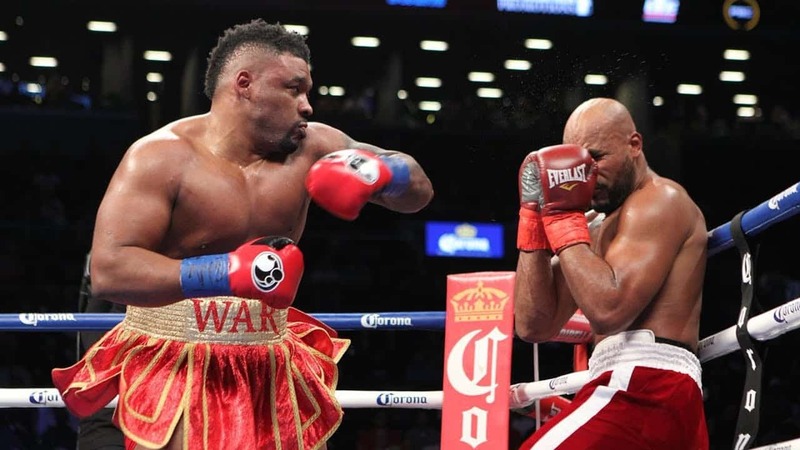 Top American heavyweight contender Jarrell Miller continued his unbeaten streak and improved his record to 23-0-1 (20 KO) as he knocked out Bogdan Dinu in the fourth round at the Kansas Star Arena in Mulvane, Kansas. The fight was streamed live on DAZN in the United States and Canada and Sky Sports in the United Kingdom. This was Miller’s third fight this year. His last outing was against Tomasz Adamek last month at the Wintrust Arena in Chicago. He won the fight via stoppage in the second round. Bogdan Dinu did fairly well for the first two rounds. He fully utilized his height and reach boxing sharply behind his jab and circling the ring. But by the third round, Miller got his momentum back and started applying pressure on Dinu and landed the heavy and crisp body shots. By the fourth round, Miller was totally dominating Dinu and beating him to the punch. Miller then landed a solid combination followed by a left hook to the head which dropped Dinu hard on the canvas. The Romanian heavyweight was barely able to beat the referee’s count but soon was sent trembling to the ground by a right hand from Miller. Even though Miller already has had three fights this year, he is ready to take on British heavyweight by the end of the year. Although he said he wants to fight Anthony Joshua, he knows it’s not a realistic option. He, however, plans on fighting Dillian Whyte. “We’re just trying to work out what to do next,” he told DAZN. “We want AJ but he’s little busy, if Dillian Whyte’s gets past Derek Chisora, I want one of them. “But I heard about Trevor Bryan, another unbeaten fighter, so I can knockout unbeaten fighters. Let’s see if Trevor Bryan picks up his phone, I will kick his behind out as well. “It’s about time I knocked out a Brit. The Brits, right now, are top of the list and there’s just me and Deontay (Wilder) as the two undefeated American guys and Deontay’s fighting a Brit. ‘Big Baby’ said he is desperate to fight a Brit, so far as so, he is even willing to fight journeymen like David Allen and David Price. “He’s called out ‘AJ’ but Tyson Fury’s stepped up, so if I can’t get ‘AJ’, I’d like to take Dillian Whyte, Derek Chisora, even a David Allen or David Price. With his third stoppage victory this year, Jarrell Miller has shown no sign of backing down. He is willing to fight anyone inside the ring and with a fourth-round stoppage victory over an unbeaten heavyweight, he has put the entire division on notice. Miller is a good boxer but once he meets Josuha or Wilder he will be knocked out for the count.